Jabatan Mufti Kerajaan Negeri Sembilan with corporation from Jabatan Fizik Universiti Malaya are organising Konvensyen Falak Negeri Sembilan (Astronomy Convention Negeri Sembilan) this weekend. In conjunction with this convention, Jabatan Mufti together with Falak-Online will hold an Astrophotography Competition. The participation form and more details on the competition can be obtained here. 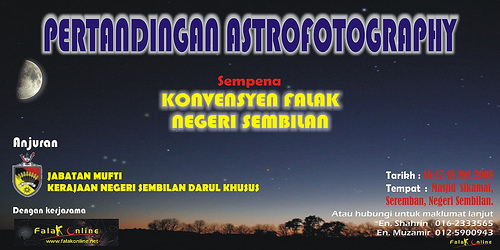 The submitted astrophotos must be taken only on 16 & 17 May and at Masjid Sikamat, Seremban. The photos have to be submitted by 18 May 2008, 8:30 am. Deadline for registration is on 17 May 2008, 5 pm. There will be a total of 8 prizes. First prize is RM1000 cash. For more info on the competition, please contact En. Shahrin 016-2333565 or En. Muzamir 012-5900943. ~ by thChieh on May 15, 2008.